When is a center console not a center console? When it’s a Canados 428 Gladiator. 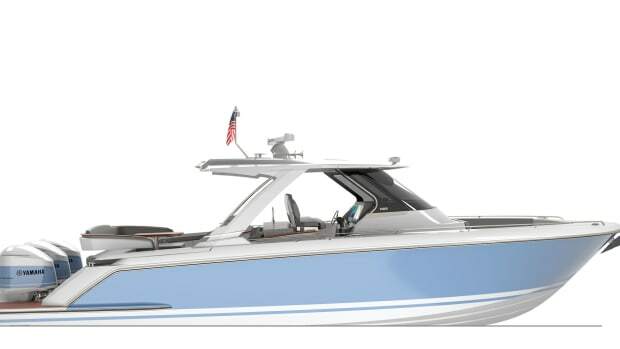 This newest model of the Gladiator series may have the helm console on centerline, but she’s so much more than a center console. 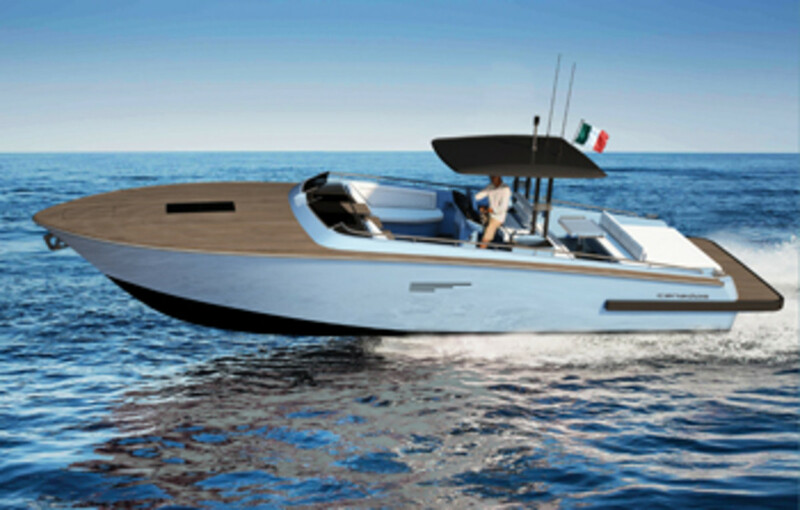 Designed by Canados and Marco Casali — naval architecture and styling, respectively — this 42-footer combines the aggressive demeanor of an offshore raceboat with an elegance that defies conventional practice. 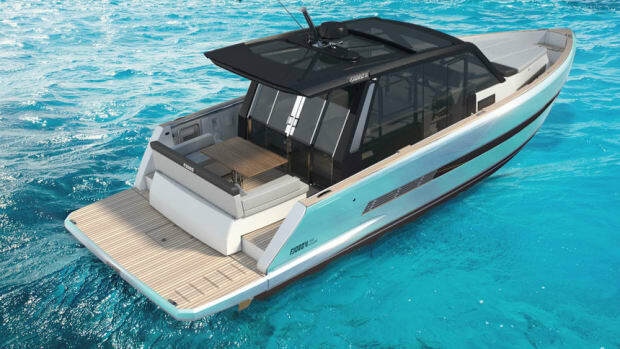 We’ve become so accustomed to seeing character lines, sometimes delineating colored sections of the hull, and dramatically shaped portlights in the topsides to disguise acres of freeboard that the Gladiator’s clean profile surprises us. At rest, framed by one of the best reverse sheer lines I’ve seen and the static waterline, the 428’s profile is a nautical art form. Any adornment would wreck the balance and muck up the artist’s statement. Drawing this profile was a brave move because the Gladiator needs quite a lot of freeboard forward to allow adequate headroom below. 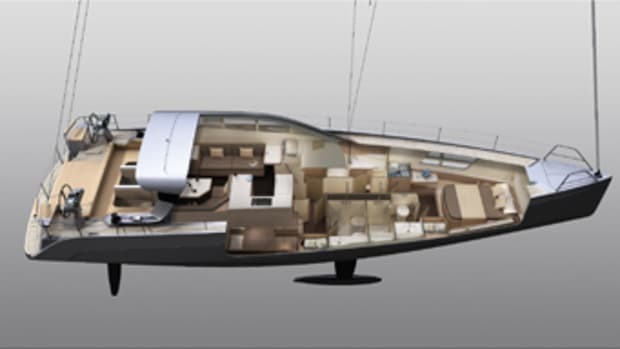 The crowned foredeck helps increase overhead volume in the cabin, but if Casali had relied entirely on crowning, the foredeck would have been ludicrously high and ugly. As drawn, it’s perfect. A reverse sheer always slopes downward to its terminus at the transom, and the boat’s purpose dictates how severe that slope is. 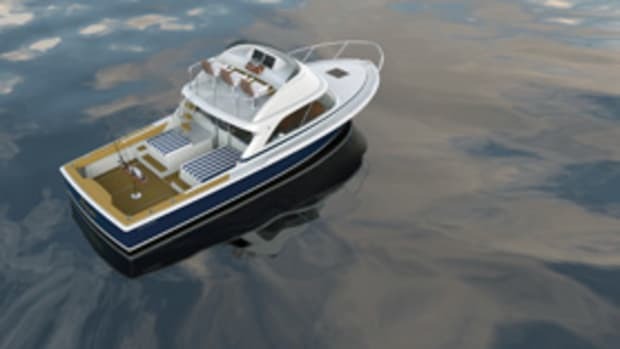 A modern 42-foot cruising boat, for example, requires more freeboard aft to accommodate a stateroom amidships and a saloon abaft the helm. 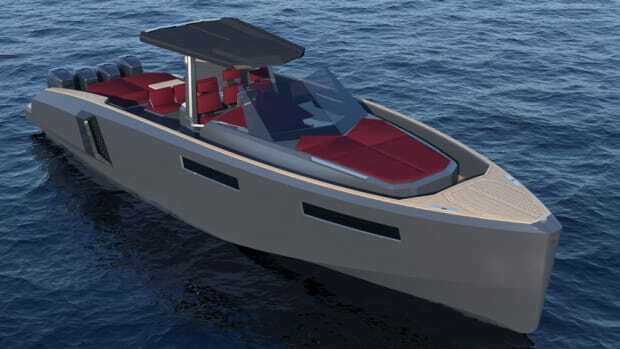 Casali, on the other hand, had the freedom to draw a racy shape because the 428 houses only low-profile machinery and stowage below from the helm to the swim platform. The minimalist cockpit coaming reduces our perception of bulk amidships and visually caps the design. 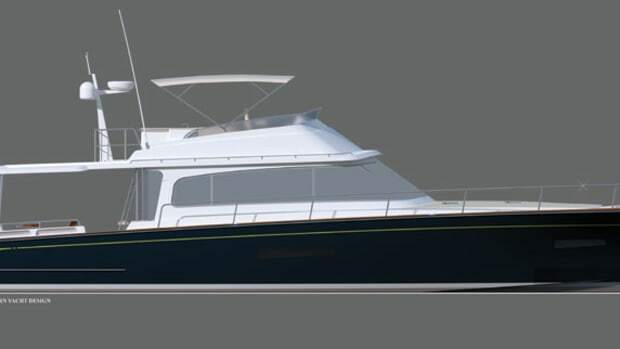 Although a delicate hardtop shelters the helm and galley, the 428 would look better without it. Viewed from above (plan view) the deck line is wide forward and narrow aft. This tells us that the 428 has a substantial amount of flare in the bow sections. Flare keeps the deck dry and increases buoyancy forward as the boat batters head seas. It also creates an art show of shadows and highlights along the topsides, especially when the boat is at rest. 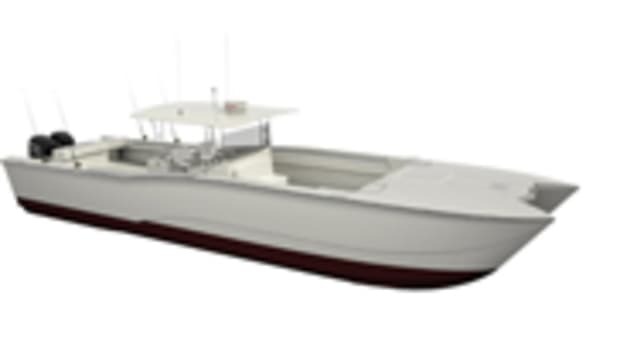 Boats of this type are generally great party platforms, and the design team has enhanced her social nature by providing comfy-looking lounges to port and starboard, just forward of the helm. These allow the skipper to stay in touch with at least two guests as the 428 dances across the water to its next stop. A large sunpad at the after end of the cockpit seems like a wonderful place to relax. It’s over the planing surface, and the motion back there ought to be gentle. As has become common these days, the deck/sole is a single level from the helm to the end of the swim platform. 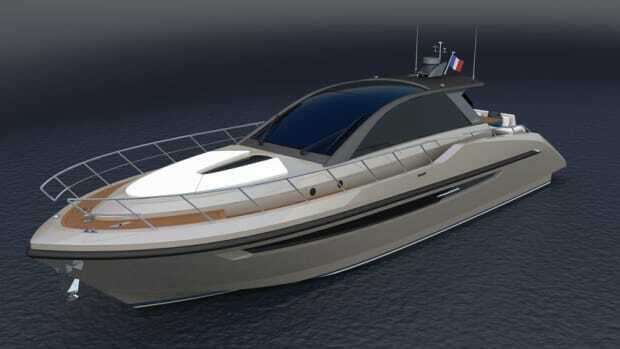 The prototype 428 was under construction in March and is scheduled to make her debut at the Cannes Yachting Festival in France in September. An outboard-powered version is scheduled to appear at the Fort Lauderdale International Boat Show in November.